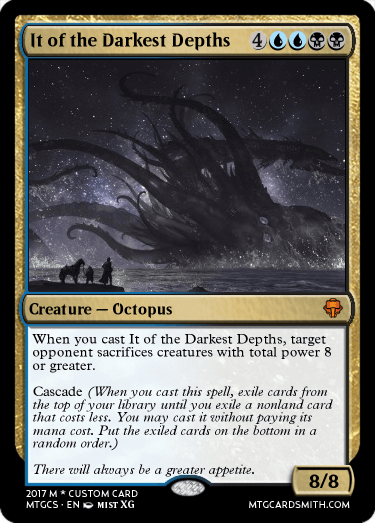 If you've made a creature that can end a game, or wipe out your opponent's creatures post it here. 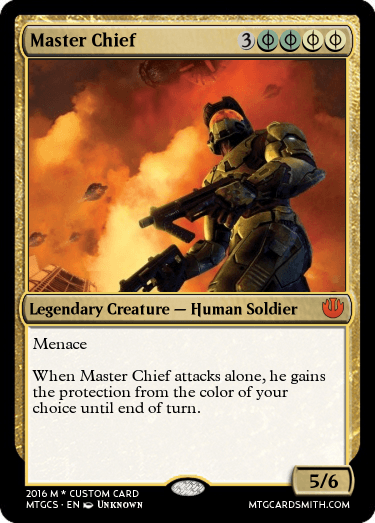 I also want people to comment on the cards that people post here, because otherwise it's pointless. I made this quite recently. Definitely one of my strongest creatures. I've made quite a few game enders, but this is the strongest. This might be my closest to something resembling a game ender. Now I feel like making more. This one too I think..? Here is a pretty powerful one! Korramazadeh. 50/50 with every ability in the game. Here's one of the broken, flavor-fail creatures that I love and will eventually remake. Made it forever ago for The Ultimate Showdown before I knew there was a color pie and before I understood the power and flavor behind pyrexian mana. Still love it. These two both do very similar things putting them together. 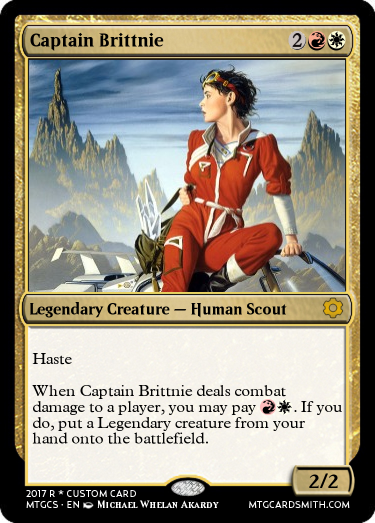 Brittnie was before I played any modern. 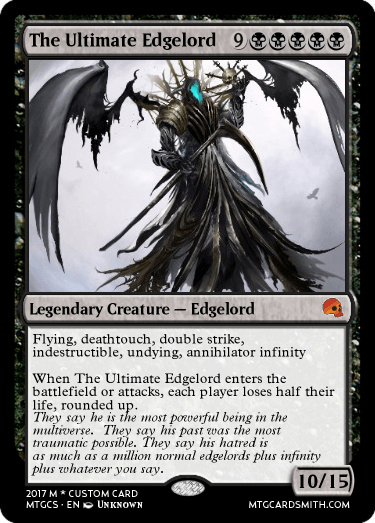 I usually only play edh so there aren't Emrakeuls all over the place. 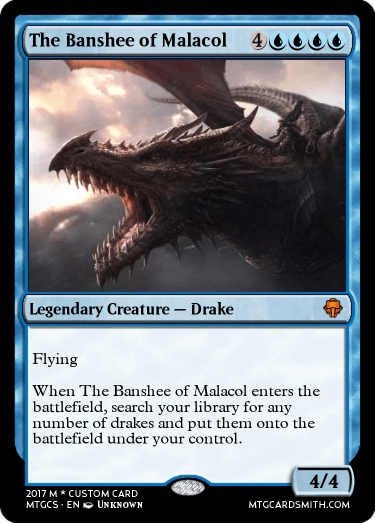 The Banshee of Malacol I'm not sure is that busted, but it looks super fun in a jaw dropping way. The most powerful card I have ever made is powered by Hulkamania itself. 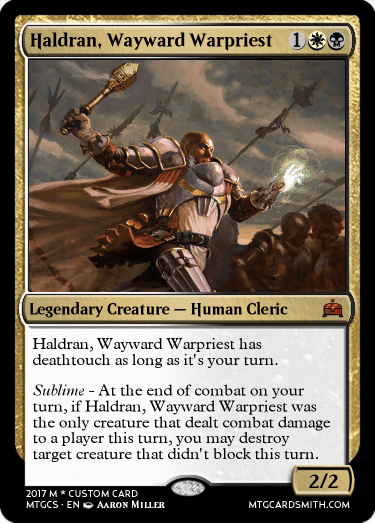 And how op phyrexian mana could be. So... any card that could be a game-ender can go up here? 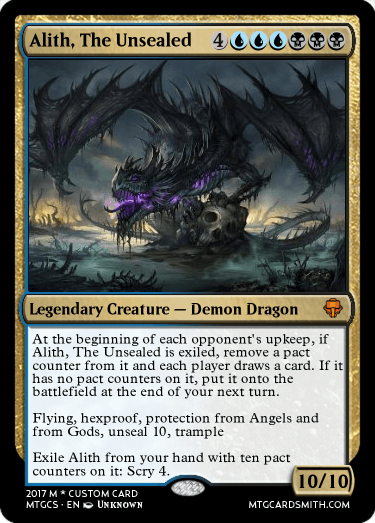 Whether it be bc of general goodness or simply OP? Well then... After I am done writing a post that I am honestly curious as to what happens when I put it up, I have some sifting to do. behold, Quo'aqo. he who destroys and creates. 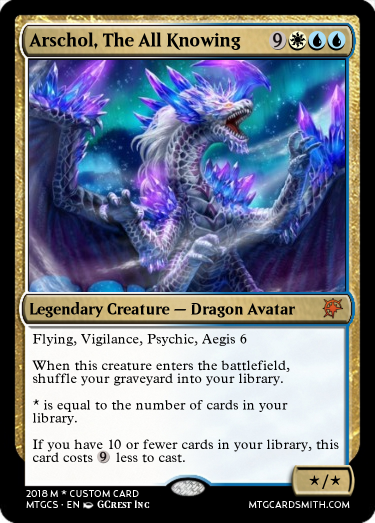 creator of Nicol Bolas. Slayer of the Three Titans. conqueror of the entire multiverse. It might be my dog, if I actually made a card of Copper. You two need to listen to JT Music's "Doomguy vs Master cheif rap battle"